Spring Special – 50% Off Retail Purchase with New Storage Unit Rental! If you need boxes and moving supplies in Renton, we’ve got you covered at The Stor-House in Renton, WA. We sell the moving supplies you’ll need to make your move easier. We stock boxes to pack your belongings and plastic covers for your mattress. We even have moving blankets to secure and protect your antique furniture collection. The Stor-House has it all! Contact our Renton store today! 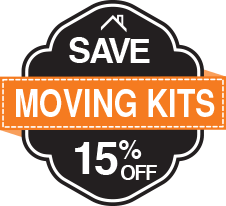 Pick up all the moving supplies you need to get going. Our Storage Experts can help get your move started right. **Discout valid only with new unit rental. From southbound I-405, take exit #4 and turn left on NE 3rd. From northbound I-405, take the Bronson Way exit (Exit #4). At the stoplight turn right and go under the freeway, turn right on Sunset, then right again on NE 3rd. The facility is located at the top of the hill on the right-hand side, just past Mt. Olivet and the neighborhood of Liberty Ridge. You can’t miss us!